The Blasters we use are the latest N-Strike Elite range including the Mega Range, Mega Bows, Mega Cyclone Shock and BIG Shock. Also the all NEW N-Strike Modulus Blaster and even newer Tri-strike, the ultimate Boy Power Blasters. We also stock 10 Regulators for the dart hungry guys who like to see the darts fly far, fast and accurately. Also in our extensive armoury are 20 very rare Speed Swarm blasters that anyone can use even a five year old who finds some of our blasters to difficult. So, we have blasters for everyone especially Dads who never get old!! 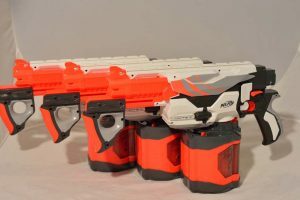 We also have six extremely rare Havok Fire Blasters to protect your bases, the kids ultimate blaster with chain feed and 25 rounds in one press………. simply awesome. We also have Blasters for our female players including the Rebelle Range of Blasters, the ultimate Girl Power armoury especially for girls. New for 2016/17/18 with NERF Rival, it has been in the wings for almost 4 years and has finally landed on our shores aimed at the next generation of hero’s who want more power, more accuracy, more distance before stepping up to Paintball. 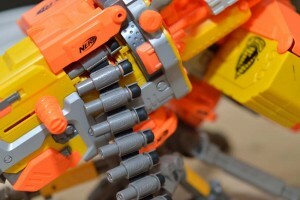 Nerf Rival Zeus, Apollo, Khaos, Artemis and the awesome Nemesis, all here with us. In this month (Jan 2018) we are trialling the NEW Phantom Corps Hera, Helios and Kronos, the new neutral colour scheme is ultra cool. The fun never stops, ‘it’s Blast or be Blasted’ at Mega Blaster World. 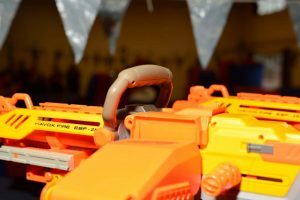 “NERF blasters used in connection with our parties/events are not modified in any way as we only use standard equipment as bought from Hasbro Inc outlets and trade suppliers in the UK”.